Over the past 30 years we have seen a large number of natural disasters all over the world. From hurricanes to tornadoes and earthquakes, terrible things have happened to people that have not just ruined several lives but have also destroyed property. Thousands of lives have been destroyed due to natural disasters. As a result of this there have been several federal jobs created so that people can help and rescue one another. If you have wanted to work in this field, read this post to learn how you can help! 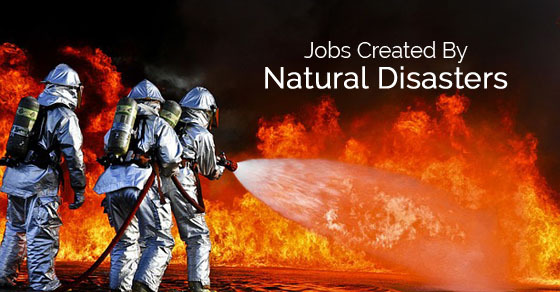 Before we tell you about the jobs created by natural disaster, here is a short definition on what natural disasters really are. According to ‘basicplanet’, a natural disaster can be defined as a catastrophic event that is caused due to an imbalance in the natural processes of the earth. The severity of such disasters is always measured by lives that are lost, population, economic losses and the renovations that are needed in the aftermath. Events that occur in areas that are not populated are however not called disasters. This position is about coming up with emergency plans from before and hiring experts who can handle the duties and tasks given to them. They are supposed to work during emergencies, especially natural disasters. The emergency management directors are made to communicate with the state as well as local law enforcement on a regular basis. The annual salary of people falling under this category is somewhere around eighty-two thousand dollars a year. Those who think they can handle difficult situations can definitely try their luck as fire investigators. These guys are expected to examine all fire scenes, extinguish fires and of course find out how it happened and where it came from. Their job includes questioning witnesses, gathering more evidence and putting important points down in a document. Fire investigators are made to work in private sectors and may also handle fire scenes at local or federal level. Those who become fire investigators should be professional and experienced in fire management from before. A job that is often sought after these days has to be one of a construction worker. After a major natural disaster has occurred, these guys are expected to work and repair the damages caused during the catastrophe. Though they are exposed to human drama, pain and a lot of suffering, a construction worker must continue to do his job like any other normal person would. After all, he is responsible for making things come back to normal. So if you are strong, well educated and would like to take up this job, go ahead and send your application. Several economists these days tend to look at natural disasters as some kind of opportunity which they can use to build broken things once again. During this time they work on those materials that are outdated. From old and poor facilities to telecommunication grids and infrastructure, these experts are made to rebuild and style everything that was destroyed. They are expected to make it look new, advanced and more polished. Though it looks quite cynical but we must always remember that a catastrophic event is painful and therefore we need such people who can build and restore our faith in humanity again. This job is particularly for those who enjoy music, can play different instruments and would like to make some money out of it. A relief musician is someone who plays music after a disaster occurs. During this time people are disturbed and are frantically looking for help. People who play sweet music will help the victims feel calm if not anything. The job of a relief musician is, in fact, becoming quite popular these days. A famous musician from the city of New Orleans, Branford Marsalis himself has organized a band and organization known as the Musicians Village which built around 80 homes along with a centre of music where those who have been affected can find shelter and help. A third job created by natural disasters these days is one of a relief worker. Here one is expected to provide medical help and care for all those who are heavily affected during any catastrophic event. When the earthquake disaster hit Haiti, there were more than thousands of relief workers and disaster relief volunteers who went immediately to rescue people in need. The team include doctors, engineers and construction workers as well. They were made to offer health care to those who were heavily injured. If you are looking for a great place to work in the states, an environmental planner could really help you. They pay well, have great government ranking and is also a fine opportunity for those who want to help people in need. Jobs like this expect you to have a degree in agriculture, chemistry or natural resource management. If you have studied another discipline which is related to biological sciences, there is an opportunity for you as well. However, you must be skilled and experienced before applying for such jobs. Whether it is paid or unpaid experience, volunteering in any community or organization, you must have proof to show that you are capable of. For those who don’t mind travelling during natural disasters, becoming a part of the emergency management team in the USA will really help you. You should be a citizen of the United States with a passport to apply for this job. Also, registration in selective disaster services is required. Not only that, you will be judged on the basis of your training, education and previous experiences. Your salary will be above seventy-five thousand dollars annually and your duties are expected to be delivered on time. So if you want something like this, go ahead and send your application. A job that is hectic, expects you to work 40 hours a week and pays you handsomely is a veterinary research technician. For this type of job, you should have bachelors degree although most of them do prefer masters or a PhD. You should have around three to four years of experience as a technician before you can apply for this job. Also, you have to do some special things in order to become eligible. Firstly, you should be able to lift around 50 pounds at a go. Secondly, you must work in an independent manner and follow all instructions given to you. Third, you will be expected to perform duties while wearing respiratory protection. If you have what it takes to become a technician, go ahead and give it a shot. The job of an environmental analyst is very much crucial in times and situations where a natural disaster has recently occurred! For this, you are expected to have good analytical skills, proper technical and written skills, oral as well as communication skills along with some good experience when it comes to Microsoft word, excel, access and the other software applications which fall under this category. You must have a bachelors degree in order to be eligible for this job. Some of them who have graduate degrees in biology or chemistry are considered before the others. So getting a good degree can always help you land this job. An assistant resident director is always needed after a natural disaster has occurred. There has to be someone who can handle the situation and work on rebuilding those buildings and apartments that are broken. Also, this person has a team which sends people to help those who are in distress. For jobs like this, you have to have strong skills when it comes to solving problems, experience when it comes to working with adults, having good organizational skills and the ability to interact with the staff. A restoration filed technician is one who comes with a team of other field technicians. These guys are expected to restore hospitality and protect families after a natural disaster has occurred. Some of the duties performed in this category include setting up equipment for structures which are drying, loading and unloading building materials along with machinery and tools. You also have to be able to restore water and fire. Cleaning job sites and preparing for them is equally important. The only con about working in fields like this is that you will be expected to report at any time. Emergency duties may happen anywhere. So you should be there to show some support. One of the best jobs you can get in disaster management is managing fire. Although it could be a risky job, it pays you well and you don’t have to be too educated to be able to do the job. You will be expected to investigate and examine all evidences whenever there is a fire. Also you have to be able to stop fires and save several lives. For jobs like this, you have to have a high school diploma with some good academic training. Generally jobs like this can fetch you a good salary. People working in this field can earn up to fifty two thousand dollars per year. So if you think you can do it, go ahead! If you want to work in the emergency department, this job should definitely help. However in this case you will have to deal with nuclear power plants. The specialist here have to work under the REP program which is known for designing emergencies, response plans and also evaluating the local, federal as well state capabilities who can execute plans that are well designed. The specialist here has to work in close proximity to the nuclear power plants. They also have to be near regional authorities and show some sort of participation in all Radiological Emergency Preparedness Situation exercises. Another department we think you can definitely try your luck in is one of a flood manager. However for this job you will have to wait when a flood occurs. Depending on your education you could also be sent to research labs where you can predict whether a flood is on its way or not. You will also be expected to work in areas that are flood prone. Community based education is also present for those who want to become a part of its so that they can learn more about the management plans and protect lives. If inspection is required in some areas, you will be expected to be there first. So if you think you can handle jobs like this, apply immediately. There are scientists always needed in the field of research, especially when it comes to natural disasters. People are always needed to guide and help others protect themselves if a natural disaster occurs again. For this you will have to have a PHD in one of the medical sciences or any other related discipline. Chemistry and biology are two to name. There are other subjects that fall under the category. Find out before applying! This brings the post to an end. If you are well educated, strong and intelligent and would love to work in the natural disaster relief team, then these jobs will definitely help you in some ways. All of them are well paid, will keep you financially secure and help you reach your goals. Most importantly, all these jobs have vacancies right now so if you want to send your application, let nothing stop you. Also if you have enjoyed reading this post and have some feedback to give, please drop a comment below. We would love to hear. Your questions mean a lot to us. So don’t forget to add them either. On that note, good luck and here’s hoping you find what you want! Previous articleFemale Bosses Vs Male Bosses: Who is the Best?